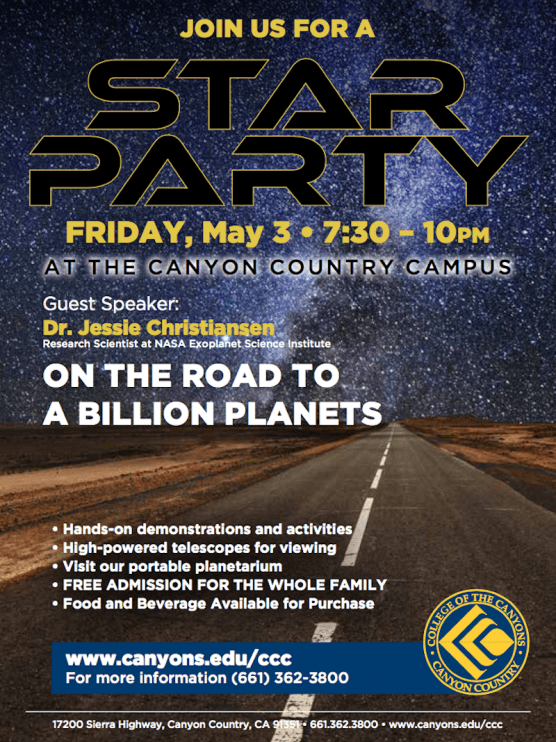 The semi-annual spring Star Party is touching down on Friday, May 3, at the College of the Canyons Canyon Country campus with students and community members of all ages invited to take a peek into our solar system. The spring 2019 Star Party will take place from 7:30 p.m. to 10 p.m. Friday, May 3, at the Canyon Country campus’ Carl A. Rasmussen Amphitheater. The Canyon Country campus is located at 17200 Sierra Highway. For more details about the spring 2019 Star Party, visit the Canyon Country campus website.